The Carnegie Endowment has published the best short overview of the Middle East situation I have read. Read the entire Pdf file. "The New Middle East," by Marina Ottaway, Nathan J. Brown, Amr Hamzawy, Karim Sadjadpour, Paul Salem, Carnegie Endowment for International Peace, February 2008 . • Lebanon and Syria: The Bush administration narrative that sees Lebanon as the battleground between democracy and autocracy must be replaced by a more accurate perception of a deeply divided country where all factions invite outside intervention. The United States needs to work towards compromise in Lebanon, rather than promote confrontation, and realize that compromise includes accepting an armed Hizbollah and a degree of Syrian influence. H izballah believes that Mughniyah's assassination is part of an Israeli plan to decapitate the leadership of militant anti-Israel groups as a precursor for launching a new war against the Shi'ite organization. "Mughniyah was killed in the context of an open and comprehensive war through which Israel is preparing for another war," Nasrallah said at a ceremony Friday marking the beginning of the annual "week of the resistance," in which dead Hizballah leaders are honored. Nasrallah warned that Hizballah was more than ready to fight another war and threatened Israel that its army would be destroyed if it entered Lebanon. "We will kill you in the fields, we will kill you in the cities, we will fight you like you have never seen before," he said speaking via a large television screen before an audience of tens of thousands of supporters. "Your army will be destroyed in the south and so will your prestige and you will remain without an army. Israel cannot last without an army." Learn to Trade with a FREE Guide.DUBAI (Reuters) – Egyptian President Hosni Mubarak said Syria was part of the problem in Lebanon, calling on Damascus to help resolve the 15-month crisis before hosting an Arab summit next month. “The summit will be held in Syria and Syria is linked to the Lebanese problem. Therefore I hope that Syria would solve the problem,” Mubarak said in remarks aired on Al Arabiya television on Tuesday. “We should not be (in Damascus) resolving a problem that Syria is a party to,” Mubarak said during a visit to Bahrain as part of tour of Gulf Arab countries aimed at unifying positions ahead of the annual Arab League summit. Arabiya said Mubarak’s remarks were originally broadcast by Bahraini television. Lebanese Prime Minister Fouad Siniora said last week the summit would collapse if Lebanon remained without a president because of a power struggle pitting his Western-and Saudi-backed government against an opposition led by the Shi’ite Hezbollah group, supported by Syria and Iran. “I hope the Arab summit is held with full force (attendance). But there are problems such as the Lebanon problem which is a fundamental one,” said Mubarak, whose country and regional power Saudi Arabia have been leading mediation efforts to help Siniora’s government resolve the standoff. Syria is keen for high-level representation at the March 29-30 summit but Arab divisions over Lebanon have cast a shadow over the meeting. Diplomats said Saudi King Abdullah and Mubarak might miss the summit. A senior Syrian Foreign Ministry official said on Sunday that Damascus hopes a president will be elected in Lebanon in time to attend the meeting. This month the United States expanded economic sanctions on Syria, first imposed in 2004, for what it described as Syria’s role in destabilizing Lebanon. Damascus says achieving stability in Lebanon is in its national interest. And for many people this is the crux of the matter. Our discussion has made it clear that even you QN support tactics that Hamas and Hizballah use (such as blowing up busses) out of pragmatic reasons (that they are effective). At least you are willing to be honest about it. Alex and Enlightened are waffling this point. But let’s put it on the table and let’s discuss it openly. Let’s understand what each side believes. Perhaps once you learn that most Israelis support using cluster bombs you wouldn’t want to make peace with us? Or perhaps when I gurantee that in the next war, Israel is going to be more aggressive and attempt victory, you will decide that there is nothing to talk about? I see, from your words, that you are proving Finkelstein right. You are essentially telling me to pick the phone, call my mother and father, grandmother and grandfather, aunts and uncles, and let them know that they should prepare to die as collateral damage in the next war with Israel, which will be ten times larger? At least you’re honest about it. Our discussion has made it clear that you support tactics that the IDF uses (turning back the clock in Lebanon 20 years, killing hundreds of civilians, destroying infrastructure like bridges and power plants, blowing up ambulances, flattening entire villages, strewing cluster bombs that don’t hurt Hizbullah militia men but only maim and kill curious children, causing oil spills) out of pragmatic reasons (they are effective… but not really). I’ve already made it clear to you that I don’t support targeting civilians. Why can’t you do the same? That was the point of our little game… to test your own ability to prove yourself a rational and humane person. Instead, you play word games with me. Let me offer you another concession, in our hypothetical scenario here, just to show you how dead-end your position is. I will condemn the killing of civilians in no uncertain terms. This means that I unilaterally reject bus bombings, discos, pubs, cafes, etc. Furthermore, this means that Hamas and Hizbullah should only target military personnel. Fine. Now we agree, in theory. How would this play out, theoretically? Clerics tied to both groups issue fatwas saying that such activities are categorically illegal, according to Islamic law. Therefore, the groups can only attack military targets. Do you think that there would be any real change? The Qassams and Katyushas would continue to rain down on Israel, claiming to be targetting military personnel (uniformed or not). They would deeply regret the killing of civilians but assume this burden as collateral damage. It’s a mirror of the Israeli position. After all, this is how modern militias fight occupiers. Do you really want to go round and round like this, or come to some understanding with me? Israel does not negotiate with terrorists. This “truism” is one of the biggest spins in the history of spinning. Israel has always negotiated with terrorists and will continue to negotiate with them as long as we continue to cherish (Jewish) human lives. Israel is negotiating with Hizbullah for information about its two kidnapped soldiers. Israel is negotiating with the Hamas for the release of Gilad Schalit. If it were possible Israel would hold direct negotiations with Hassan Nasrallah and Khaled Mashaal themselves. But the two of them are not willing to conduct direct negotiators and third-party mediators are carrying Israel’s offers back and forth. Almost no one in Israel criticizes the basic idea of negotiating with these terrorists for the release of kidnapped soldiers. Most Israelis will be willing to pay a very high price for their release. WHY WOULD negotiating with Hamas for a cease-fire that has the potential to save tens, perhaps hundreds of lives in Israel be any less legitimate than negotiating with Hamas to save one human (Jewish) life? The Hamas leadership in Damascus and in Gaza have both sent messages that they are interested in a cease-fire with Israel. In order to be clear, they are speaking about what they call tahadiyeh or a “calming down,” and not what is referred to as a hudna, or a long-term cease-fire based on Islamic history and teachings. The tahadiyeh is thought to be relatively short-term in nature (about a year), although there are no rules on the time frame and it could be more or less. It could also be extended beyond the initial agreement. The Hamas leadership has stated in public and in private conversations that it is willing to guarantee that the tahadiyeh will be observed by all factions in Gaza. The leaders have also stated that they want the agreement to be a package deal that will include a prisoner exchange and the release of Schalit, and an agreement on the opening of the Gaza border crossings, particularly the border with Egypt. HAMAS understands that it must have a deal for a cease-fire before it reaches an agreement for the release of Schalit, because once Schalit is out of Gaza there is nothing that will provide any protection for Hamas leaders from Israeli fire. It is, therefore, more than likely that there will not be any deal for the release of Schalit that will not include a cease-fire. This is something I tried to make clear to Prime Minister Ehud Olmert days after Schalit was kidnapped, when I was first approached by Hamas leaders with the offer of a cease-fire (more than 600 days ago!). Hamas also wants a deal on the borders because without an arrangement that will provide for the movement of people and goods in and out of Gaza, the population there will once again break the borders by force, with potentially horrific consequences. Israel’s economic sanctions policy has been used against the population in Gaza with the hope that the population will turn its anger toward the Hamas leadership. This policy never really had big chances of success. It might have worked better if the Palestinians in Gaza had suddenly seen a significant contrast with developments in the West Bank under Mahmoud Abbas’s leadership, but since Annapolis not even one important checkpoint has been removed. And with the exception of Ramallah, there is no visible economic improvement anywhere in the West Bank – in fact quite the opposite is what people see and feel. THE BREACH of the Rafah border planned and implemented by Hamas achieved a surge in public support for the its government. The chances that economic pressure from Israel would change that is nil. Such pressure will now only boomerang against Israel and against Abbas, who is viewed by many Palestinians as an Israeli collaborator. That is why the Palestinian president and his prime minister are now speaking out in public and in private against the economic sanctions. A senior official in Abbas’ office told me that Abbas is now interested in a cease-fire arrangement with Hamas. It is true that he has his own conditions for such an arrangement. Mainly Abbas demands that he be a party to the negotiations and to their outcome, so that it be clear to all that he is president of all of Palestine, including Gaza. It would certainly not be a surprise if he were to demand from Israel that the cease-fire arrangement include the West Bank as well. FROM THE point of view of reaching a cease-fire that will put an end to the rocket attacks on Sderot, it is important to include the West Bank because if Israel does target and kill a Hamas or Islamic Jihad political or military leader in the West Bank after the Gaza cease-fire goes into force, it is likely that there will be a response of rocket fire from Gaza in retaliation, and then the cease-fire agreement will become very short-term. Without a cease-fire arrangement the eventuality of a large-scale Israeli ground operation in Gaza is quite clear. Eventually a Kassam will hit a significant target – a school bus, or a kindergarten or shopping center, God forbid, and the number of casualties will be significant and the government of Israel will have to respond. In that case the number of casualties of Israeli soldiers as a result of Kassams will increase from zero to only God knows how many. The causalities among the Palestinians will probably be in the hundreds – and many of them will be innocent civilians finding themselves in the line of fire. Throughout the fighting inside Gaza, Hamas and the other forces there would continue to shoot rockets, at an increased pace, into Israel; and probably on the same day that Israel decided to leave Gaza more rockets would be fired, just to show that all the might and force of the IDF is not enough to break the Palestinians’ will to fight. A military attack against Gaza will not achieve the strategic objective of ending the attacks from there against Israel. Only an agreed on cease-fire with the Hamas will stop the Kassams. I think Shai is right: going round and round with you is not only pointless, it’s actually harmful, and counterproductive. So I’m going to unilaterally withdraw from this debate, in the interests of everyone else. They’re probably sick and tired of listening to us. You can tell your higher ups at AIPAC that you won, if it makes you feel better, no problem. If you’d like to continue this debate further, let’s do it privately. Create a new email address, and use it in one of your posts (instead of the fake one you normally use), and I’ll contact you there. I think AnotherNJGuy is probably not taken. Damascus will allow Hezbollah to remain active because it is popular throughout the Muslim world, viewed by many as successful. This means, that Syria has strong control over HA, he is calling for a deal,with USA, this will raise suspicion, about who killed Mughneiyeh. He is criticising USA harshly , In my opinion the ambassador should improve the relations between Syria and USA, he seems to to do the opposite. You are essentially telling me to pick the phone, call my mother and father, grandmother and grandfather, aunts and uncles, and let them know that they should prepare to die as collateral damage in the next war with Israel, which will be ten times larger? I would recommend that if you tell your relatives to heed the leaflets left by the IDF at the on-set of future hostilities, and take shelter FAR away from the areas where the Hezbollah are located, they should be alright. My son did left the area when Tiberias was shelled by Iranian-supplied Hezbollah forces, but, of course, there were no leaflets to be found. Nevertheless, he was relocated far enough away from the area. Of course, the best thing would be to ensure the Lebanese government takes full control of their armed forces in order to prevent another round of fighting from even starting. But as we all know, that will never happen. Tell your relatives that Israel has a right to defend her borders just like any other country and that maybe, one day, the Lebanese will stand up to the instigators of violence. If your relatives live in Occupied Palestine, may I suggest that you put in a similar call to them. They are also within the reach of Lebanese and other rockets. Incidently, how does it feel to have a taste of your own medicine for a change?? Is that a leflet they should cosider.?. You may not remember but in 1991 Saddam fired Scuds at Israeli cities. Of course, you would have supported him then also. Israel did not retaliate, but apparently people like you and others on this blog thought that since this works and Israel does nothing, it is a strategy that should be adopted. Now you complain about Dahyeh and the the South of Lebanon. People with short memories always pay the price in the end. Ya AIG, I think your latest posts are being reflected like an echo. QN has spoken and I think (believe?) he will hold to his principle of no longer playing volley-ball with you. May I chime in ? This, of course, is not QN nor MSK nor Enlightened, etc., speaking by proxy, this is just nerdy old HP. Soooo…. – Targeting civilians is completely rejected and illegal, regardless of who is the author and what is the reason. This is categorical enough so no need for examples. OK, I’ll give you examples: blowing up buses, cafes, killing athletes, tourists, etc. – The question is then the civilian “collateral” damage. The problem is that Israel considers itself justified in causing a large number of civilian deaths under the pretext that they have no choice but to go after “terrorists” and that these “terrorists” hide behind civilians, hence leaving Israel no choice but to cause these deaths. Right? Well, here is where the conscience of any honest Jew should create torture for him/her. Let’s cite examples: (a) we need to assassinate a Hamas political leader, so we use a massive missile to blow up his car and anything within 1/4 mile of it, even if it is traveling in a dense civilian neighborhood, thereby resulting in a significant massacre of civilians. (b) we receive intelligence about a value target in South Lebanon and, even knowing that the location is or likely to be a place of gathering of a large number of civilians, we nevertheless go ahead with our humongous bombs and risk — and in fact often do — cause yet another massacre. Additional examples abound. This reasoning is not acceptable. It is criminal, and is completely rejected. It is equivalent to police blowing up a building where a criminal is holding 100 hostages, killing criminal and hostages, in order to get at the criminal. It is not done, and neither should Israel’s criminal tactics. – Within Israel proper, some citizens are more equal than others, based on religious affiliation. [Reminds you of Animal Farm, doesn’t it?]. Let’s not call this democracy unless ALL citizens are treated equally. Israel is. (Read as Israel exists). It is thriving economically and militarily (not to mention in scientific output, etc.). It is populated by a majority of good folks who are paranoid about being subjected again to agony they have suffered throughout history. They are told that they are going to be thrown into the sea, wiped off the map, etc. They look at the demographics of the different groupings in the area (usually identified by religious affiliation, but also by other labels), and they realize that their group has different values (not necessarily better, just different), their birth rates are (exponentially?) smaller, and they legitimately calculate that they will be diluted into extinction (relatively speaking) in time if they are integrated with the other groups. Conclusion: Israel, (a) has the right to exist, (b) has the right to ensure agreements with its neighbors guaranteeing that it will continue to exist, (c) has the right to define its own system of government and treatment of its citizen, but, if it continues to have some citizen “more equal than others” then does NOT have the right to call itself a democracy. The rest of the elements of “Moving Forward” have been enumerated earlier by many (including me) and are accepted by such a large majority that it is really a crime to delay further the achievement of peace. Until that happens, Israel’s tactics resulting in such disproportionate civilian deaths (and other destruction as in Lebanon in 2006) are to be condemned as criminal. Just because suicide bombers cruelly target Israeli civilians does not give justification to Israel to quasi-reciprocate. Nowhere was the imablance so flagrant as in the distribution of casualties between civilian and military during the 2006 summer conflict for the Israeli vs. the Lebanese Hezbollah. Numbers speak for themselves and the moral superiority that Israel tries to claim is not borne out by these numbers. Put it simply, they killed Lebanese civilians; Hezbollah killed Israeli soldiers. Regardless of who was targeted, this is what the result was. AIG, unless and until you have the moral courage to acknowledge the criminal aspects of such behavior, renounce it as a way forward, choosing instead to justify it as a response to the (at least equally) savage methods of suicide bombings and targeting civilians that some Palestininans have pursued over the years, then QN is right, we have no basis for an honest and open discussion on ways forward. If you want to move forward then you need to give me a way to fight terrorism that does not cause collateral damage. Otherwise, it is business as ususal and all you are advocating is surrender. …. and… Majed, Ausamaa, et al., this is what I mean by using persuasion and strong arguments in the “fight” with Israel…instead of simply throwing labels around and then supporting Arab terrorism. It’s all wrong. All terrorism is wrong. Killing civilians is NOT self-defense. AP, I’ll be sure they get the memo. In the meantime, I’ll also let Hizbullah know that all they need to do to avoid being called terrorists is to shoot some leaflets at you before launching their rockets. Nice to know we’ve cleared that up. AIG, I’m still waiting for that email address. Let me be frank with both of you. You’re not going to get a more sympathetic Arab ear than mine (or HP’s). If you do, then it’s likely to belong to a bigot who is not taken seriously by 95% of the population. If you can’t step down from these extreme assertions of yours and try to cultivate some humanity and confidence with somebody who (a) recognizes your right to exist and thrive; (b) condemns some of the actions of your enemies; (c) speaks out publicly against zealots and dictators… then you will continue to be lonely for a very long time. Israel should recognize that its war in 2006 was a disaster, and it should try a different approach. Every incursion into Lebanese territory is like a stamp of approval on Hizbullah’s claims that i needs to continue its defense of Lebanon. If you want to get rid of this threat, then you need to be smarter about it. I’m afraid we need to go back to the old restrictions. After a couple of weeks of constructive input, you are back to spinning and distorting. I have written at least three times that I am completely against Hamas tactics when it involved targeting innocent Jewish civilians… I called it terrorism and murder… but because I added that Israel murdered many more innocent civilians, you needed to classify me as a terror supporter! .. the only thing you and the people who sent you here can tolerate is a total focus on the murderers in Hamas … no one can point to your savage criminals … if anyone to do that, then you try to label him as a terror supporter… and apparently it does not help me when I state that I am not justifying Hamas actions with Israel’s actions … I am appalled by both … and much more by Israel’s actions. Forget answering me. Move to other points, 5 comments max per day, no more character assassination for others here. a) When the time comes to negotiate with Lebanon, who do we talk to – Siniora, Nasrallah, or both? b) What guarantee can Israel receive from Lebanon, that Hezbollah will be disarmed, and will not be able to act on its own offensively once peace is agree upon (specifically, should this take place BEFORE a settlement is reached with the Palestinians)? c) Should Israel really explore anything with Lebanon at the moment, before making peace with Syria? To most Israelis, the answer seems to be a clear “No”. d) Siniora commented that Lebanon would be “last to make peace with Israel”. Should Israel therefore explore anything with Lebanon prior to a settlement with the Palestinians? Let’s start with these questions first, and then move forward. “Killing civilians is NOT self-defense”. I can agree, but can we add: And watching the civiliians on yourside getting killed by ISRAEL and not doing anything about it is mere cowardic and poor math to say the least? Besides, have you noticed that every war or bombimng carried out by Israel from Qibia and Dier Yassin (long before Fateh, Hamas and Hizbullah came to existance), to bombing the British King David Hotel in Jerusalem, to sinking the Liberty, to the bombing Qana, to Qana2, can all be called a dfensive act; after all they are all carried by the Israeli DEFENCE Forces!!! ( A trick they borrowed from the British Colonial Manual no doubt, when England was set only on defending its “natural” geographic boarders; stretching Hong Kong to India to Boston, Mass, to the Falkland Islands). Remember!!! In the end, Hizballah is more of a problem for Lebanon than for Israel. I agree that the best Israel can do is have several years of no war between wars. Syria can always find a group in Lebanon to arm with rockets. But that is also the worst Hizballah can do to Israel. Another war or two like the 2006 war will bring to the end of Lebanon but will not do much to Israel. I am sure you are a nice person QN, but what do you bring to the negotiation table? Basically nothing. The Lebanese government cannot stop Hizballah and change their ways. Neither can Israel, but it can make war very costly for Hizballah and its supporters thus ensuring several years of quiet between each war. That is the most that can be hoped for. DAMASCUS (Reuters) – Syrian tycoon Rami Makhlouf said on Tuesday U.S. sanctions would not stop him expanding his business empire and announced he was in talks to sell a majority stake in Syrian’s leading mobile operator Syriatel to Turkish counterpart Turkcell. “A deal between Turkcell and Syriatel would cement relations between the two countries,” Makhlouf told Reuters in an interview. “I cannot say, however, that we will reach an agreement. The negotiations are ongoing,” he said. Makhlouf, Syria’s most powerful businessman said he was considering selling between 51 percent of Syriatel or more. Turkcell said in November it was looking at bidding for a controlling stake. The 39 year-old executive is the cousin of President Bashar al-Assad. He owns 69 percent of Syriatel. Gulf investors and Syrian shareholders own the rest of the company, which controls HITS-Unitel, a Yemeni cellphone operator. Members of the Saudi royal family also have a stake in HITS-Unitel. But Makhlouf’s conglomerate, which stretches from telecoms to banks and an airline, does the majority of its business in Syria. He has ventured into heavy industry and property development as local real estate prices spiked. Makhlouf pointed to a $100 million joint venture between his Cham Holding company and Dubai Emaar Properties due to signed on Wednesday as evidence of an undiminished appetite to do business with companies he has stakes in. “This venture will develop areas in Damascus that turned chaotic because of illegal housing. We are talking about first-rate urban projects,” Makhlouf said. He said Syria Pearl airline, in which he owns a major stake through Cham Holding, was seeking to buy a fleet of planes made by Canadian company Bombardier. The airline, in which state-owned Syrianair was granted a 25 percent stake, aims to regain market share lost by the national carrier to foreign airlines. “Syrianair has six aircraft, which is unacceptable for a country the size of Syria,” he said. Syria’s airline sector opened to private companies last year as part of limited economic liberalization measures ordered by Bashar al-Assad. However sanctions imposed by the United States on Syria in 2004 have undermined efforts by the government to attract investment, although billions of dollars of Gulf capital is estimated to have been committed to projects in Syria in the last few years. The United States froze the assets of Makhlouf on Thursday under new economic sanctions aimed at stepping up pressure against Damascus, saying Makhlouf benefited from corruption in the Syrian government. The Treasury Department designated Makhlouf under an expansion of U.S. economic sanctions against Syria announced February 13 by President Bush. The designation freezes Makhlouf’s assets under U.S. jurisdiction and forbids U.S. citizens or entities from doing business with him. Makhlouf said he “did not have a penny” invested in the United States. © Reuters 2008. All rights reserved. Republication or redistribution of Reuters content, including by caching, framing or similar means, is expressly prohibited without the prior written consent of Reuters. Reuters and the Reuters sphere logo are registered trademarks and trademarks of the Reuters group of companies around the world. Excellent questions. I’ll do my best, but I can’t promise not to change my mind later, as I have not thought all of this through yet. I’ll take your last two questions first. The answer is, in my opinion, that peace with Lebanon should come after or simultaneously with a peace with Syria, however this does not need to happen before a settlement with the Palestinians. The Syrians will not allow the conditions to develop in Lebanon that are suitable for peace, because this means taking away their strongest card, for their own negotiations. So, we have to play this game according to their rules. This is reality, and it actually makes more sense, anyway. If a settlement can be reached with the Syrians, whereby the Golan and Shebaa are given up (according to whatever formula is acceptable), then I do not have any doubt that Hizbullah will give up their weapons, or be integrated into the Lebanese army as a special commando division. Nasrallah makes this point in almost every interview… because he is asked, in almost every interview! There is real anxiety in Lebanon about Hizbullah’s weapons, even among supporters of the group. Most people (i.e. 95% I’d say) are not interested in an existential struggle with Israel to the death. And most people do not want an armed militia in Lebanon for longer than is necessary. After the 2000 withdrawal, there was growing pressure on Hizbullah to disarm and many people (myself included) felt like our intelligence was being insulted by the pretext of Shebaa. So, I think that Hizbullah understands that they need to disarm in order to have a political future in the country. Remember, this is not a tiny little minority that needs to hold on to its guns to survive… they’re the biggest minority in Lebanon! They have a future in this country and in this region, so they’re not worried about losing their support when the militia is disbanded. So, as for questions (a) and (b), I’d say that Israel will inevitably negotiate with the Lebanese government itself, which will include representatives of Hizbullah. And as for guarantees… I have to think about this. What do you have in mind? (5) Declare that Israel seeks the support of all Arabs with a conscience to renounce the targeted killing of any civlian whether through direct targeting or through “collateral” damage. Make the declaration clear and unambiguous. Refer to the Arab League initiative indicating that it forms a basis if the existence and future of Israel as a Jewish state can be guaranteed. Look for the response. Times have changed. This will work. Alas, even Shai is telling us that the Israeli statesman to take such an initiative is unlikely to emerge. I don’t believe it. If I were an Israeli and I studied very carefully all the future scenarios, as well as history, I would see this as THE MOMENT to seize. And if still a Qassam is fired at Sderot or terrorist attacks continue, what then? Then you would accept collateral damage? I would accept your plan if you agree that if it doesn’t succeed you will accept Israeli attacks. Not sure what you meant by “… however this does not need to happen before a settlement with the Palestinians.” (Par.2) – can we have peace with Syria before concluding one with the Palestinians? As for guarantees, I suppose in the peace agreement itself with Lebanon, there will have to be indications that the Lebanese government will be responsible for safety on our border, so that in the interim period, until Hezbollah actually disarms, there is only one body “in charge”. Ideally, Hezbollah would need to be represented at any peace talks between Lebanon and Israel, and be signatory to any agreement, much as was the case during peace talks between N. Ireland and England. Have to think more about this point, because the equivalent situation with redeployment of Syrian and Israeli troops following a peace agreement would probably be supervised by foreign countries, out of mutual concern of both nations. So something similar would have to take place with regards to Hezbollah. If I knew you’d be there for the inauguration, I’d run for PM myself! For the first question, you are then talking about an outlaw individual, group, or illegal armed party within another state seeking to sabotage peace and perpetuate the mutually imposed carnage. Dealing with it will involve intensive pressue and seeking unambiguous condemnation not only by Israel’s allies but by the states now declaring willingness for peace: Syria, KSA, etc. Insistence on a thorough investigation of the incident with neutral International presence is the first step. I know one thing, the approach of an eye for an eye is not working. That’s part of the answer. The other part is that technology is evolving in such a way (probably classified) that it will be possible (if not already) to pinpoint the source of such rockets. This will make the investigation and identification of the guilty folks and hence appropriate punishment of the guilty (instead of collective punishment) possible. I know that there are many saboteurs out there. I also know that Arabs have consistently displayed in the last decades an utter lack of discipline and ability to reign in the spoilers. Only one who has experienced how bad it gets understands this. You do. Believe me I do too! Your way has not worked other than to perpetuate a state of war interspersed with oases of peace and continuing misery of select civilians on both sides. You need another way. Waiting will not work, either (as you advocated). Before you know it, this will become a nuclear conflict. The Iranian bomb will happen. If not, you have Pakistan. There’s no end to this except with real peace and justice. Well that’s what I think. We probably will have to agree to disagree, then sit and wait. Oh, yes, we can also pray while we’re waiting. (And I’m not being facetious). I understand your position and it is a reasonable one, but as you say we will have to agree to disagree. You are optimistic about the ability of Arabs to deal with spoilers in the future, while I am pessimistic based on their track record. Take Hizballah after 2000. Most people in Lebanon wanted them disarmed but instead we got the July 2006 war. Take the Qassam rockets. Much more were fired after Israel left Gaza. As for praying, my grandfather used to say that it can’t hurt. I’m an atheist so I will leave the praying to you. Yes, sorry, that’s what I meant. I don’t think we need to wait for a full settlement with the Palestinians. Better to create the momentum for one. As for Hizbullah, they have to be part of any agreement. Look, (and this addresses something that AIG and HP are talking about) Hizbullah is nothing if not supremely disciplined. They are extremely good about controlling their people, and what Nasrallah says is followed. If an agreement emerges that incorporates Hizbullah and gives them something to lose if it is sabotaged then you can count on them keeping the peace. Waiting is a privilege I think we do not have. Like net population growth in Egypt, so too is our future a ticking time-bomb. We must get every ounce of energy available, and every man, woman, and child ready to “battle” this rapidly approaching explosion. We have no choice, time is not on our side. Israel can have all the guarantees it needs.. the Syrians only sign on what is good for the Middle East (in their opinion) … so they will be happy to guarantee it will happen. And Nasrallah is not known for cheating or flipping. Besides, today we are not able to fool people like it was possible in 1978 … no PR campaign can make an unattractive deal look attractive. There are blogs, Arab Satellite TV stations, and many other ways through which Syrians and Palestinians will study any signed deal… spinning works only when there is a low degree of involvement or association at teh popular level with the piece of reported news …. therefore, a peace deal will not be spinnable. So … Syria and Lebanon simultaneously, but negotiations with Syria should lay the proper foundation for “the new Middle East”… after tearing down the joke of a foundation that Neocons tried (and are still trying) to build. Will your new Middle East come with birth pangs, or will it be delivered via Caesarean? I see a potential for some problems to arise vis-a-vis your reference to the Palestinians. The three of us agree that peace with Syria/Lebanon will only do good for the Israeli-Palestinian conflict. It will, in my mind, apply “healthy” pressure especially on the Palestinian people to reach a consensus on their demands vis-a-vis Israel, and not to be left behind while the entire Arab world sends its ambassadors to Tel-Aviv. But then here’s the problem – how can Assad sign a peace treaty with Israel, without looking like a Sadat? We can write on a peace of paper ANYTHING regarding the Palestinians, the territories, heck even their right-of-return. But until we actually implement these, no one knows if and when they’ll happen, hence the Sadat-Begin-case. And, as I tend to believe, no such implementation is likely anytime soon, because Abu Mazen cannot deliver even if he wants to, without Hamas’s cooperation and approval. So what do we do? Do we wait until the Palestinians have sorted out their problems, and only then start talking with Syria? We just basically agreed not to do that, right? Do you see the problem? What do you suggest? I do see a problem, but not the same problem you are seeing. I am reasonably confident that Syria can help with the Palestinians … But not a Sadat type of Syria … that Syria, the one that agreed to flip, will lose the ability to help you assemble a reliable, popular Palestinian partner. You can have for few years international (European plus Syrian and Egyptian) forces in the West Bank and Gaza … no Syrian tanks, just a well armed police force. Remember the incredibly successful coalition that James Baker built in 1991? … he started by seeking Hafez Assad’s participation … He and President Bush Sr. both agreed that if Syria is not part of the coalition then it will not be successful. You don’t have to re-invent the wheel … ask James Baker to help you assemble a similar coalition … with the Syrians there to guarantee it is not a conspiracy against the Palestinian people. So .. you do not have a problem getting a dependable response from the Palestinians or the Lebanese … your problem is in accepting the 1967 borders more or less … and in convincing your country that “Syria” is not going to be taken out of its environment. If you can do that … then there is no problem .. Israel will have all the security and friendly relations it wants to have … everything will fall in its right place as you go along … you will see. But of course … it starts with convincing Washington that the Arab world does not rotate around “the Kingdom” … Egypt and Syria must be equal partners in designing the new middle East. The foundation I am talking about involves serious non-revocable commitments … not only Annapolis type of good wishes. I agree with my Syrian master on this one. I understand your suggestion for a multinational force to be present in the West Bank and Gaza to ensure the Palestinians are living up to their end of the agreement. But I’m still stuck back before reaching an agreement. Who do we talk to? Abu Mazen? Hamas? Who’s in charge? And until we know who really IS representative of the majority of the Palestinians, how can we possibly sign an historical agreement, and especially a very complex one that will involve many nations, probably previously-unheard-of funding (for the compensation part), etc.? Who will actually police the streets of Jenin, Ramallah, and Gaza really is of almost last concern at the moment, I believe. Though you’re right that certainly Syria could contribute by sending its soldiers or policemen to help out, I cannot fathom a single Israeli agreeing to that right now, before Syria and Israel reach a peace agreement, and have had an opportunity to prove to one another their honest intentions and corresponding implementations. There still is this innate distrust and suspicion, and we need some time to get rid of it. But I’m still at the point of Assad looking like Sadat. If we do not conclude an agreement with the Palestinians yet, and we restart talks with Syria, and even conclude these talks with an agreement, how can Assad NOT look like Sadat? If we haven’t started implementing anything vis-a-vis the Palestinians, because we haven’t signed a peace treaty with them yet, how can anyone be sure that what’s written on a piece of paper really will take place? No serious problem there Shai .. I will explain in 30 minutes. Ok Alex. But i may already call it a night by then. In which case i’ll respond to it in the morning. I see … I forgot you are old. Well… Yeah, older than i’d like to admit.. 🙂 But seeing as my two daughters think they live on New Delhi time, and wake me up at 05:30 MY time, i usually head in by midnite, in order to get some sleep… Otherwise i start saying silly things on SC, and you’ll end up restricting me… But in the meantime, i’m still here. You are undermining confidence building measures with these cheap digs at Shai. You’re no spring chicken either… not like 17-year old me. 1) Israel needs to reach a clear conclusion that Syria can help deliver on the Syrian/Lebanese/Palestinian tracks if a good agreement is reached. 2) Israel needs to work on different fronts to stop the relentless PR campaign against Syria … Israeli, American, Saudi, M14 Lebanese … many (not all) are directly, or indirectly influencable by Israel and its friends. 3) 2009 … New American administration can only make things better in every way. 4) Syria will manage a couple of interesting CBM’s if it is obvious by now that a consistent effort is made to stop smearing Syria in the media … consistent for like 6 months. 5) By now … lack of trust in Syria will be dealt with to some extent… the Israeli public will not fear an international coalition that includes Syrian peace keepers. I would not be surprised if a similar arrangement is reached for Iraq after a new American administration shows up in Washington. Syria is not Sunni and not Shia .. it is not an American puppet and not “a traitor” and not an America hater .. Syria has 30 years experience with peace keeping in Lebanon … the Syrian army is effective, neutral, disciplined, and most efficient costwise. 6) Peace talks start … discussing the Syria Israel terms of settlement .. and these are 80% agreed upon supposedly. In the mean time, strategic discussion should take place … the LEbanese/Palestinian/Iraq/Turkey/Iran related discussions are not irrelevant … making peace with Syria is your best opportunity to make peace with the rest of the Arabs and Turkey and Iran … let it take a year if necessary .. but these talks should involve reps from all countries at different stages… you have to show that you really want to live in peace with everyone… you have to help Syria in helping you in the future with the Lebanon/Pelestine/Iran “tracks”. 7) You can sign an agreement with Syria at that stage … and Syria will be content that all the others were involved in the talks … no one will be able to say that Bashar went alone to Camp David to finalize a selfish deal. It is up to Israel to respect the spirit of the foundation-setting talks for that new Middle East. At least you are willing to be honest about it. Alex and Enlightened are waffling this point. But let’s put it on the table and let’s discuss it openly. AIG you make Goebbels look like a propganda amateur. I told you I abhor violence period whatever side it comes from so dont mis represent my position. I reiterate my position that not only are you The Syria Comment Idiot, you are now crossing the threshold of utter stupididty, and lunacy AIG,. There is tension in the air. That is between key players in the Arab world. Lebanon might appear as the central point of contention between Syria on one hand and Saudi Arabia and Egypt on the other. But the issue has in fact more to it than the long-stalled presidential elections in Lebanon, for which some Arab countries blame Syria and its Lebanese allies. The tension is threatening to sabotage the upcoming Arab summit, scheduled to be held in Damascus on March 29, the first in Syrian history. The summit is usually the place where Arab states discuss, and sometimes manage to solve, their differences. This time the summit itself became the centre of dispute. Saudi Arabia and Egypt are said to be thinking of shunning the meeting unless Syria “uses its influence in Lebanon” to facilitate the election of General Michel Sulaiman as president. But the tension, according to different sources – some official and others semi-official – revolves around the growing Iranian influence in the Arab region. Iran is obviously flexing its muscles in Iraq, Lebanon and Palestine, through its strong ties with powerful parties, including Hamas and Hezbollah. At a time when the Arab world is trying to achieve a peaceful, and as close to just as possible, settlement to the Palestinian question, the Iranian influence is giving power to those accused of “radicalising the Arab street”. The Israeli war on Lebanon in the summer of 2006 is an example. Through its 30-year-old “strategic alliance” with Iran, Syria is being blamed, mainly by Riyadh and Cairo, of helping Tehran exercise that influence, henceforth, threatening Arab national security and leading to a backlash that is mainly sectarian. But that is also no reason to shun Syria or the summit. Isolating Syria will only deepen the tension and push that Arab country further away. The summit should be held and used to address those contention points frankly. That is what summits are for. President Mubarak who was vacationing in Sharm al-Sheikh for ever decided to take some vitamin C and go on a long tour to Saud Arabia and the gulf states … his motivation came from hoping to convince the Emirs (and the king of Bahrain) to boycott Syria’s summit. If it is held, it will be the first time Syria hosts an Arab summit .. the first time since 1945 when Syria was one of the 6 Arab countries that starte the Arab League. In 1980 when Hafez Assad sided wit Iran against Arab-darling Saddam Hussein … Assad was internally fighting with an Arab supported Brotherhood campaign to kill him or overthrow him. If anyone wants Syria to have more balanced relations with Iran … try to put a leash back on America’s Arab puppets … the more they try to weaken Syria (like they are doing now with the first Syria-hosted summit) the more Syria will move away to Turkey and Iran… Hafez discovered the strategic need for Iran in 1980 .. and Bashar is realizing more and more that the stupid Arab leaders are proving his father was right as usual. Not too complicated. The Gulf states are smart enough to understand it .. but the Saudis and Egyptians are still trying to weaken Syria and plot against Syria. Shai what danger for Israel Hizbollah is in the end? Hizbollah has only the capacity of keeping Israel out of Lebanon (= make the price of catching South Lebanon’s water resources). Hizbollah has no capacity to attack in “a land grabbing form” Israel. Without Hizbollah Lebanon has no real defensive capacity. Certainly most Lebanese regardless of their religion do not want such a such a military (defensive) vacuum again in their country. 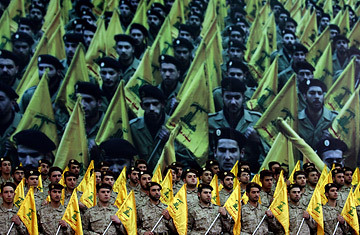 The best military option for Lebanon would naturally to “join” Hizbollah to the national army, which is undoubtedly a major problem to the country’s odd political structure. It is rather amusing that a country with the worlds forth or fifth strongest army, with uncounted amounts of nukes and other mass killing weapons is demanding security guaranties from others (far, far weaker parties) without providing any security guaranties to them. What security guaranties does Israel offer to Lebanon, Syria, future Palestine etc? The security is as essential to those countries as much it is important for Israel. As history has shown during the past six decades Israel has been the attacker in most of the conflicts. It is high time for Israel to start promising security to others instead of demanding “security” using the many ever shifting odd excuses. Israel is as the one with nukes and occupied land and it has to begin to “deliver” real security to its neighbours. Either by disarming part of its oversized army (= nukes + other gadgets) or allowing the neighbours to rise their military capacity to the level that it keeps Israel out of their territories. Security means always security for both sides. Regardless are the different parties “one religion democracies” or authoritatively ruled. Speaking for myself, this comments section seems to lose its value when it veers so off course from Syrian affairs and the specific subject at hand. Syria comment is unique in its focus on Syrian politics, history and religion (your own words listed on top). Regrettably, it has lost that focus lately. Like many others, I found the The Carnegie Endowment report to be truly worth the read, thank you. I also found Rami’s comments in the Reuters article above to be rather interesting. Innocent Criminal had recently alerted me to the fact that the Turkcell deal had not yet concluded. That indeed seems to be the case. Rami seems to open the possibility that it may not get finalized. I agree with Ehsani. Also, if I may add, I noticed that the issue of peace with Israel is almost always the focus (thanks to Alex) in the comment section, even if the post tackles other Syrian issues. I would love to read more comments about internal affairs, religion, history etc. Please … Majhool would like an opportunity to tell us how bad the Syrian regime is. Can you please post some random story that demonstrates the incredible failures of the Syrian regime? … please? some people are addicted .. they need their daily fix… it has been two days now without an anti regime story … since the Rami story. We need daily regime filth stories. But … even the perfect Rami story quickly turned into Syria Israel peace discussion in the comments section … a very unpopular discussion … everyone was bored … after 542 comments they stopped participating … can yo block Alex from the comments section? .. can you force him to discuss the Syrian regime’s corruption and Mafia like mentality? As for your comments to my questions, I tend to agree with the components, but certainly cannot see how their order could be followed as such. First, there’s no way in the world that Israelis will accept Syrian troops/policemen/whatever in the West Bank or Gaza, alone or as part of an international force, armed or not armed, BEFORE we sign a peace treaty, and even then, after some times passes and we begin to trust one another. It’s just not going to happen and, to be honest, I don’t see why it’s a prerequisite to anything. True, it would attest to Syria’s important role in the region, but I’m not sure that by not having it, Syria’s position would be undermined in any significant way. Second, I don’t see Israel loving too much the idea of discussing peace with everyone else while talking to Syria about the Golan. That sounds like a Madrid II, which may well take place following the inauguration of a new administration in Washington, but ultimately, the sides will have to conclude agreements separately. Remember, our whole premise was that we must make peace with Syria NOW, because it is easiest to achieve, because Syria is ready and sincere, and because it can and will create a positive momentum that will help the Israeli-Palestinian track. I just do not see a situation where Assad is able to say to his people “Look, we’re getting the Golan back finally, and so we’re going to have peace with Israel, but don’t worry, they’re ALMOST there with the Palestinians, as all of you can see…” What I think is most likely, is that after Obama or McCain start pressuring Israel and Syria to restart talks, the two will do just that, and the Palestinian track will, for all practical purposes, be put on hold. If you start adding too many parties to the Syrian-Israeli discussions, or if you place a condition that peace with Syria is dependent on agreements or even near-agreements with any other side, the so-called “Comprehensive Solution”, I doubt we’ll be farther down the path 3 years from now than where we stand now. Perhaps that’s what has been delaying matters for this long – the perception that without a just solution to the Israeli-Palestinian conflict, no peace can exist in the region. But forget for a moment “real peace” (or a warm one), which obviously will only occur once ALL the issues are resolved, and once forgiveness and reconciliation begins to form. Tying everything together will lead to stagnation or more Annapolis-type summits. When Israelis and Palestinians see how Israel and Syria can sign a peace treaty in Washington, and how Israel is willing to give up land it has held for decades, they won’t want to miss the opportunity to also resolve their differences once and for all. And then, Hamas and Fatah will come together, and reach a consensus, and be willing to talk to Israel. That’s the positive momentum QN was referring to, and I completely agree with it. I very much understand your concern that we are “kidnapping” these discussions in other directions. But from observing the various topics and their corresponding discussions, I noticed that this is common practice – namely, going on tangents that seem to interest enough people. It seems, at the end of the day, that the bloggers themselves enjoy going in different directions. You’re right, though, the consequence is a thinning out of an originally-intended topic discussion. Please forgive me for obviously contributing my “wisdom” mostly on Syria-Israel issues (or Arab-Israeli ones), and less on internal matters. Though these very much interest me as well. Now is also too late… and I will not make sense I’m sure. But I’ll try. 1) Syrian troops are not necessary at all … it is not a dream come true for Syria to have troops in Gaza next to Italian, Egyptian and Somali troops. I was simply offering one possible way you can have “guarantees” that a settlement in Palestine can be respected and implemented successfully and in an orderly manner. Also, I did not mean to say that Syrian troops would be there before peace agreement is signed … I meant something like one year after … when it is time to implement the newly signed Palestinian agreement .. roughly one year after Syria and Israel sign. ANd I disagree with you .. I think we Syrians have so much potential charm that within one year we will make the Israeli people fall in love with us very quickly and if necessary, they will demand ONLY Syrian peace keepers, not Jordanian, and not Somalis. and I’m only semi joking here. 2) A Madrid II is a great idea … Egypt and Saudi Arabia must be given a fun part to play … things go so much more smoothly when these two have a part to play. The leading Arab countries hate it when they don’t get invited to conferences… this includes Syria. conclusion: You are right that we should not over complicate things (otherwise it will take forever) … but … can’t ignore anything. Anyone you ignore will try his best to create obstacles … it is ok to spend a few more months to try as much as possible to talk about all the others. Yes, I do agree with that message. We mustn’t disregard ANY of the issues or other nations’ concerns in the region. But, while a Madrid II is indeed a very good idea, and while it should give not only a feeling but a very concrete role for the major participants (Egypt, KSA, Syria, others), it will inevitably be up to each side to bilaterally reach an agreement with Israel and, since Syria and Israel are probably closer than anyone else (or at least could be once talks restart), it is most likely that we’ll have peace between us first, and only then with the Palestinians. I was just starting to listen to Alon’s podcast (via MEI), which is why it took me a while to get back to you, but it seems that Washington is starting to realize its mistaken policy towards the region, and of course I’m talking about the potential leaders to come, not the existing leadership. If Obama, Hillary, or McCain come into power and immediately begin exploring a new approach, while embracing the various parties instead of isolating them, there is a very good chance for a Madrid II-style summit. But, if Israel’s PM and Syria’s President see that the new spirit is very favorable, they may not wish to wait any further and link progress too much to the Palestinian track. It is here that I fear Assad may end up looking more like Sadat than you and I can appreciate at this point in time. Question is, under what minimal conditions can this still work? I just cannot envision Assad taking a chance with the deeply-entangled Palestinian situation and its consequential difficulties vis-a-vis Israel, and risk not “grabbing” the Golan while he might be able to. I’m of course still skipping over much much work that has to be done here in Israel, to convince pubic opinion that the Golan is worth returning to Syria. But since I know some issues from your end are relevant, prior to Syrian so-called CBM’s, I’m raising these questions.